Universally acknowledged as one of the masters of operatic comedy, Gioachino Rossini created some of the repertoire’s most beloved farces: deftly combining stunning vocal displays, flowing melody, and hilarious hijinks. There are few better examples of the composer’s genius than the 1813 L’Italiana in Algeri, about a group of shipwrecked Italians stranded in an Algerian harem. 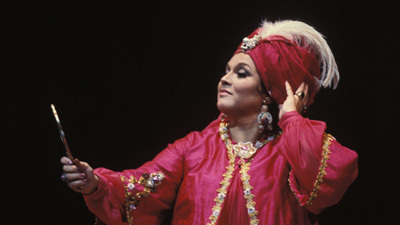 In this classic radio broadcast, mezzo-soprano Marilyn Horne, one of her generation’s most celebrated interpreters of Rossini’s music, stars as Isabella, the titular Italian girl. Maestro Nicola Rescigno leads an all-star cast—which also includes soprano Kathleen Battle as Elvira, tenor Rockwell Blake as Lindoro, and bass Ara Berberian as Mustafà—in a delightfully spirited performance.